I jokingly commented that I liked this book because each chapter is only a couple pages long. This tactic makes the book a very compelling read as you always think you can read another couple pages. That said, this story of an aging feminist writer and speaker, who suffers no fools, put me on the hunt for more books by this writer, much to my continued pleasure. Meet Florence Gordon, a blunt, brilliant feminist. At seventy-five, Florence wants to be left alone to write her memoir and shape her legacy. But when her son and his family come to visit, they embroil Florence in their dramas, threatening her coveted solitude. Marked with searing wit, sophisticated intelligence, and a tender respect for humanity, Florence Gordon is cast with a constellation of unforgettable characters. Chief among them is Florence herself, who can humble fools with a single barbed line, but who eventually finds that there are some realities even she cannot outwit. 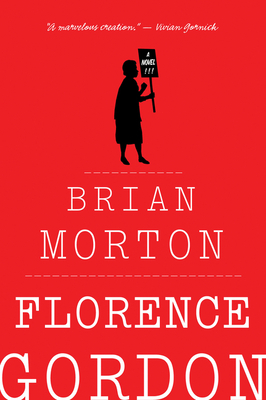 BRIAN MORTON is the author of four previous novels, including Starting Out in the Evening, which was a finalist for the PEN/Faulkner Award and was made into an acclaimed feature film, and A Window Across the River, which was a Book Club selection of the Today show. He teaches at New York University, the Bennington Writing Seminars, and Sarah Lawrence College, where he also directs the writing program. He lives in New York.